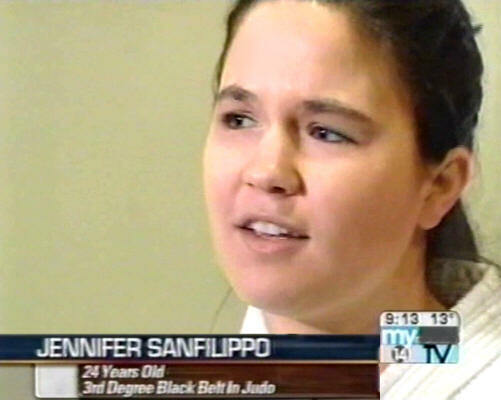 I've been doing judo since 1986. My current rank is Sandan. 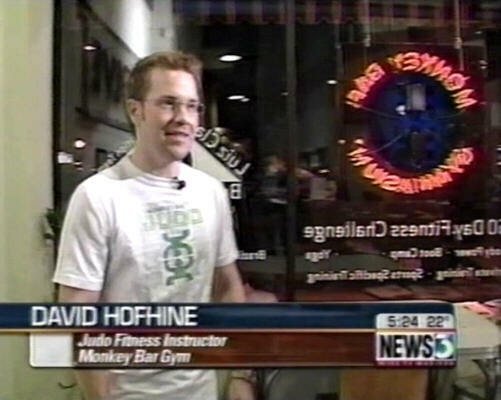 I taught at University for 9 years and then at a private club, Jon Hind's Monkey Bar Gym, for 8 years after that. This is from way way back in college. 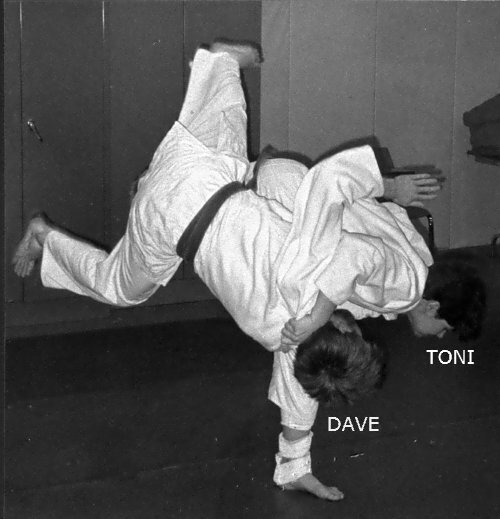 My then fiancee (now wife) Toni and I practicing judo at the University judo class we taught together. Me talking judo in prime time! The local CBS affiliate did a really great feature story on our judo club that ended up airing on a couple of different news broadcasts. More TV screen shots below. Picture of my guys at the 41st annual AAU National Judo Championships. 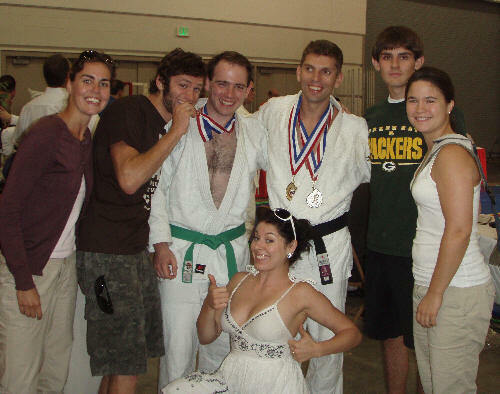 Shown left to right are Vanessa Angur (Ikkyu), Matt Marty (Shodan), Tim Freiberg (winner of a bronze medal and a promotion to Sankyu), Ellie Pengra (thumbs up! 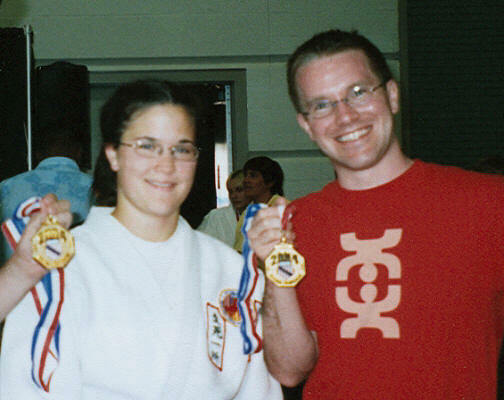 ), Anders Angur (Shodan with silver medal in Seniors and Gold in Masters division), Joe Sanfilippo (Shodan), Jennifer Sanfilippo (Sandan). 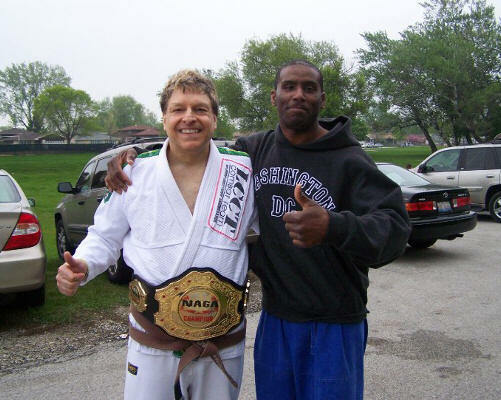 Two of my judo students at NAGA: 2010, Champion David J. Martin and James "Junior" Clark. Junior has also won the Naga Championship in previous years. 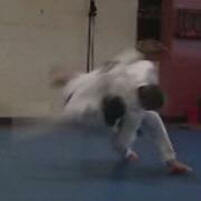 Click on the above picture to see Junior do his Nage no Kata for his Shodan promotion. The 40th Annual AAU National Judo Championships where our team competed. 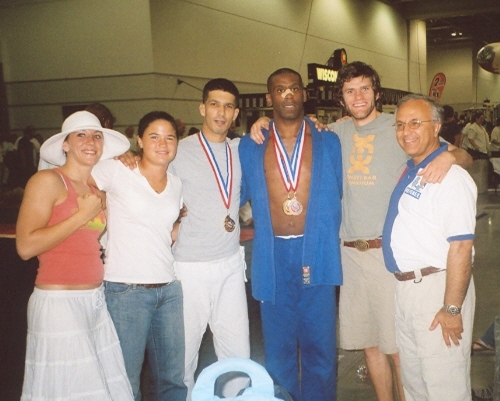 Shown left to right are Cassandra Rivers-blaso (winner of the ADCC North American Trials Championship and 2 time Gold medalist at the Pan American Games), Jennifer Sanfilippo (3rd Dan), Thales Blaso (GOLD), James "Junior" Clark (GOLD and BRONZE), Matt Marty (Shodan), Sensei Jon Sanfilippo. Photo by ME! 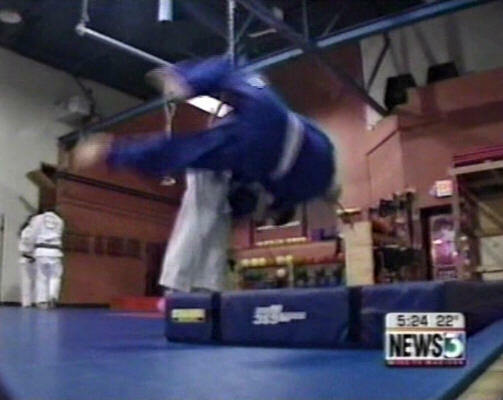 One of my students, State Judo Champion Dan Mensing, throwing some big air for the TV cameras. I've also had some articles published in American Judo Magazine. 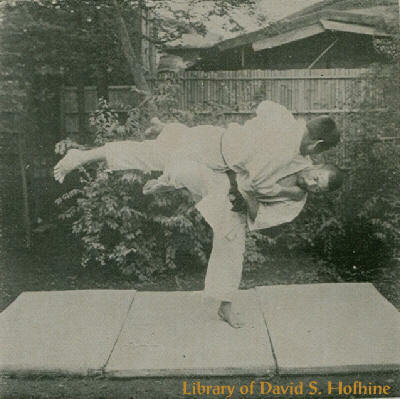 Picture from my article "Judo 100 Years Ago". Casey Blaso from my gym putting the smack down on Roxanne Modafferi during her 2007 MMA championship title bout. This fight went 5 rounds to a dubious split decision. Available on DVD and Netflix. Need Help with selling a sword?